Neanderthals were hunter-gatherers who inhabited western Eurasia for more than 200 thousand years during glacial as well as interglacial periods until they became extinct around 40 thousand years ago. While some of the anatomical regions of these extinct humans are well known, others, such as the vertebral column and the ribs, are less well known because these elements are more fragile and not well preserved in the fossil record. In 1983 a partial Neanderthal skeleton (known officially as Kebara 2, and nicknamed "Moshe") belonging to a young male Neanderthal individual who died some 60,000 years ago was found in the Kebara site (Mount Carmel, Israel). While this skeleton does not preserve the cranium because some time after burial the cranium was removed, probably as a consequence of a funerary ritual. However, all the vertebrae and ribs are preserved, and so are other fragile anatomical regions, such as the pelvis or the hyoid bone (a bone in the neck to which some of the tongue muscles are attached). So it is the skeleton that preserves the most complete thorax in the fossil record. For over 150 years, Neanderthal remains have been found at many sites in Europe and Western Asia (including the Middle East), and the thorax morphology of this human species has been a subject of debate since 1856, when the first ribs belonging to this human group were found. Over the past decade, virtual reconstructions have become a new tool that is increasingly being used in fossil study. 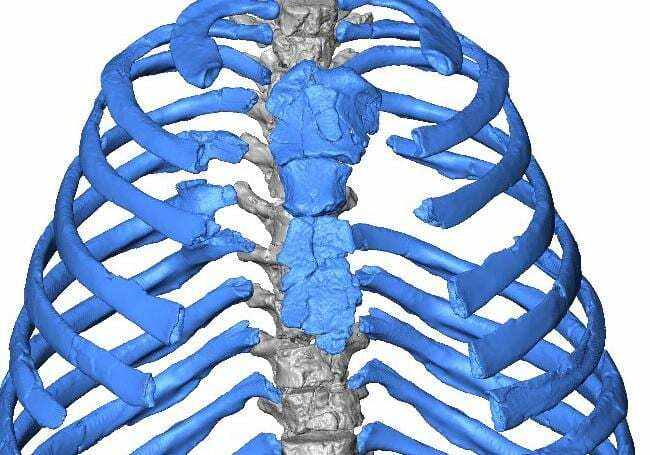 This methodology is particularly useful with fragile fossils, such as the vertebra and ribs that form the thorax. Nearly two years ago, the same research team created a reconstruction of the spine of this Neanderthal individual; it displays the preserved spine of Kebara 2 showing less pronounced curves in these humans when compared with Homo sapiens. The team's paper, published in the book "Human Paleontology and Prehistory," pointed to a straighter spine than that of modern humans.